No, this isn't a list of old-timey burgers that you have to eat before locals allow you to even refer to yourself as a Houstonian -- even though you’ve been living here for 15 years (though some of those are included). 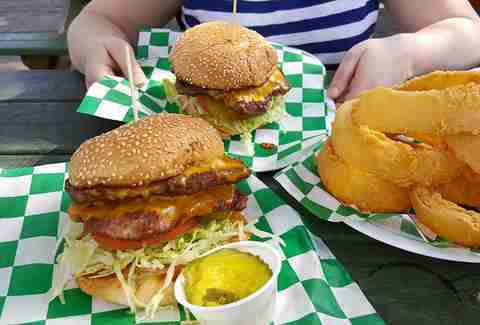 Instead, it's our current bucket list of the most vital burgers to make your way through in your lifetime... or before you leave Houston, which means you're pretty much dead to us anyway. Note: Whataburger is not included because that's a given (are you even from here?). 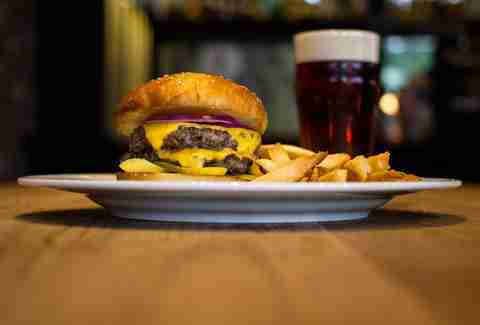 This double tavern burger may look pretty straightforward, but it’s actually one of the juiciest, beefiest tasting burgers in town. The magic is in HD's expertly seasoned blend of chuck, brisket, and don’t-knock-it-till-you-try-it beef tongue. A homemade bun, good ol’ American cheese, house pickles, and sliced red onion lend the burger just the appropriate finishing touch. Like the reptilian Star Wars beast for which it's named, this 10--napkin burger’s only desire is to FEED... feed you, that is. Made with half a pound of aggressively seasoned Angus, the beef-bomb is crowned simply with cheddar, smoked bacon, and a fried egg, because in today's crazy world, that is simple. 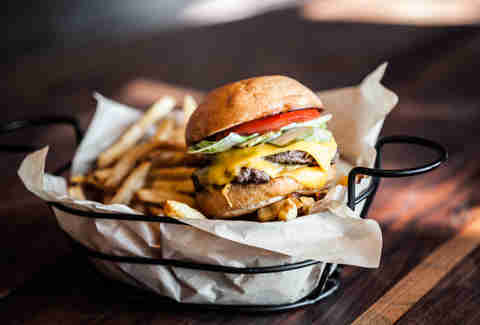 All three locations of this beefed-up powerhouse lure a steady crowd of burger lovers thanks to the excellent house-made buns; hand-formed, juice-dripping 80/20 patties; and toppings that both the burger purist and wild child can get behind. But since this is a bucket list, we’re going out with Ricky Craig’s aptly named magnum opus, the grilled weiner, bacon, chili & cheese-stacked Quadruple Heart Clogger. Hope you canceled that afternoon meeting. We think the picture speaks for itself, so we'll just say this: house-ground Angus beef, whiskey-griddled onions, BACON GRILLED CHEESE BUNS. For a damn-fine burger with a little side of nostalgia, hit this neighborhood champion of all things beef. The family-run grocer's been around since the '60s, eventually turning into a burger spot in the ‘80s when husband and wife team Art and Theresa Fong inherited it. Though the adored Art has since passed, you’ll still find Theresa flippin’ big, beefy house ground patties and making everyone feel like family. You can go full throttle with stacks of candied bacon and hash browns, but before that, get a taste of the burger that started it all. Because being the Baron of BBQ and the Sultan of Steak wasn't enough, Chef Ronnie Killen decided to add some more beef into the mix. Burger fanatics have been feeding on his fully loaded, incredible burgers during weekend pop-ups at Killen's Barbecue. Those have sadly ended, but have no fear: Killen’s Burgers is opening in the original Killen's Steakhouse location. Now the only question is, why is this all happening in Pearland? 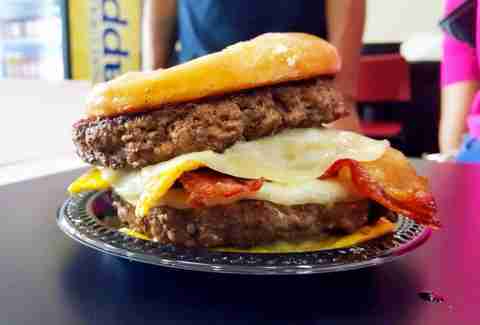 This burger is so damn tasty, it legitimately almost sparked a lawsuit. Here's how it all went down: sibling eatery Underbelly dubbed their standout burger the "UB Double Double," which apparently was a little too close to the signature burger of a certain uptight chain. Soon after, they were gifted a cease and desist letter by said uptight chain. A quick name change later, and this double-cheese, double-beef, super-legal burger can now be found serving time at The Hay Merchant. This is not the kind of place you visit on a diet, as the smells wafting from the flattop will have you gearing up for an insanely bad-for-you burger faster than you can change your Coke to diet. Since you went this far, you may as well go full fatty with this bacon-loaded, sliced jalapeño, egg, and gooey macaroni & cheese-adorned house favorite. Cash only. 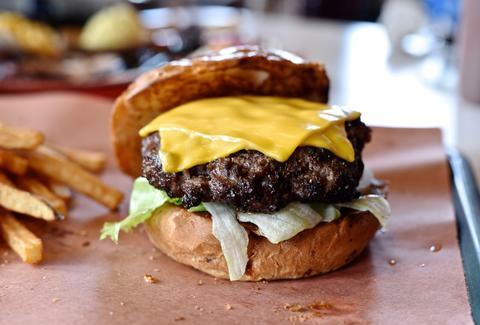 Locally sourced, fresh-formed, and sloppy as all hell, these burger gurus adorn their masterpieces with everything from queso and bacon to hot Cheetos and fried bananas. Though spice lovers can take solace in the Dang Dang, it's the Cooter Jack that hits all of our topping checkpoints. Buttermilk fried onion strings for crunch, smokey BBQ sauce for sweetness, chipotle mayo for richness and heat, and gooey jack cheese... for cheese. Get it on a jalapeño cheddar bun (our choice), a pretzel bun (some people's choice), or no bun at all (WHOSE CHOICE IS THIS???). While yes, you usually go to a steakhouse for steak, lunch is a completely acceptable time to exercise your option for something less fancy (i.e., cheaper). 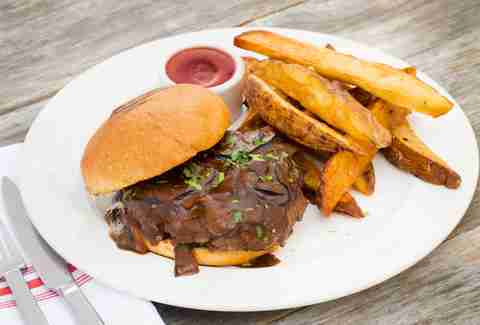 This fork and knife burger, a riff on a cognac and mushroom gravy smothered steak Diane, is well worth the $14 price tag. Of course if you're in the mood to to ball out, you can add foie gras for another $12. This homegrown joint from the Pappas family uses Prime trimmings from the neighboring steakhouse to make respectably great burger patties, which we are completely disrespecting by telling you to order covered in Fritos, queso, and Pappas chili. But it's on the menu so, their fault. All hail the great state of Texas, because not only does this burger have frozen butter chunks dotted right into the patties, it's also done “carpetbagger-style” – meaning it shares a bun with a crispy fried oyster topper, American cheese, caramelized onions, and for an extra few bucks, thick cut bacon and an oozing fried egg. Spend the extra couple of bucks. Sure we can tell you whether to patronize Tookie’s, the long-running bayside burger institution, or Stomp's, the new guy that filled the void and may or may not have “borrowed” some of Tookie's legendary burger creations during the time it was closed after Hurricane Ike, but what's the fun in that? This is America, where the people eating the beef get to cast the vote for them own damn selves. 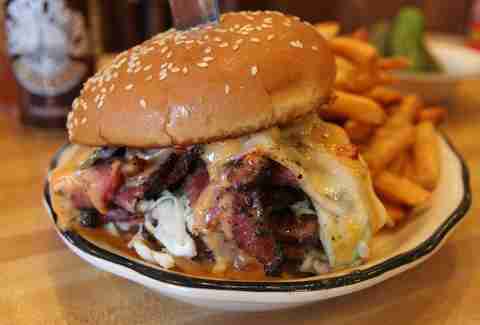 At Tookie's, go for the crowd-favorite Squealer, where bacon gets blended right into the greased up patty. At Stomp's, get the Wild Hog, where bacon also gets blended right to the greased up patty (because that thing we said about “borrowing”). With a menu chock full of good ol’ boys like pork belly cracklins and BBQ plates, it may be hard to order the burger at this Southern standout. We'll make it unhard. Top-notch cuts of beef take a spin in the grinder before being formed into two aggressively seared and pink-in-the-middle patties, each of which gets a cheese blanket before being stacked and packed into a buttery and toasted salt & pepper bun, along with house b&b pickles and fresh produce. At its side? Potato salad and comeback sauce. Long story short, you want this. As V&A expanded their lunch hours, what used to be only a Friday special is now available every weekday. Prime ground beef, house-cured bacon, and a duo of American and cheddar make this a burger worthy of Vic's good name. Head here on Wednesday for BOGO Burger Night and you won't even have to choose between the Cheech – generously stacked with thick-cut bacon, sambal mayo, poblano, and creamy goat cheese; or the Chong – a beauty with thick-cut bacon, house pickles, cheddar, Creole mustard, and a gloriously yolky sunny-side egg. Proving this Gulf Coastal concept is not all about the sea, this by-land blend of chuck and brisket comes big and mighty on remarkably good Texas Toast, crisped and slathered with mayo. 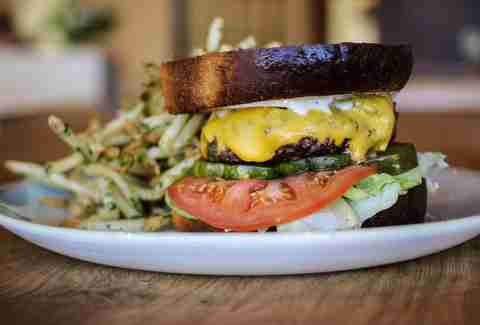 The accoutrements – house b&b pickles, beef-fat griddled onions, and L+T – are simple enough to let the juicy burger shine. Since scratch-made doughnuts slathered with a sugary glaze clearly weren't enough, these guys decided to throw a duo of meat bombs and some bacon & cheese in between two of them. It’s kinda hard to believe the heart-clogger is available so close to the Med Center... but it is, so you can hit it up after you pass your yearly physical. Housed in the former Pour Society, this rebranded concept from Cherry Pie Hospitality’s Lee Ellis and culinary director Jim Mills is bringing Texas comfort fare to new heights. As in, this colossal burger stacked high and sloppily with griddled pastrami and onions, melty Gruyère, a fat squeeze of burger sauce, and house-cut chicken-fried French fries, because this is Texas. This Jewish deli may not make their patties in house -- they're a custom blend of short rib and skirt steak from Pat LaFrieda in NY, so that's fine by us -- but they most definitely make their own pastrami. The smoky, meltingly tender slices come piled high on the 1/2lb, crazy-good burger along with ‘slaw, aged Swiss, and Russian dressing. It's not kosher, but that too, is fine by us. Sometimes, everything bigger is better. 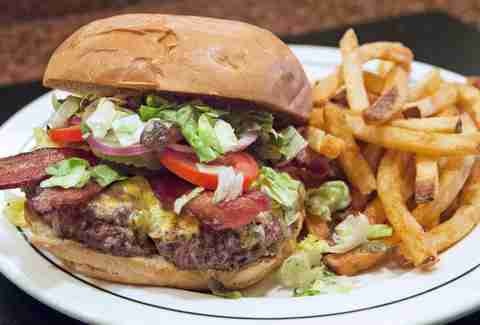 Case in point: this full pounder, which is widely considered among Houston's burger elite by anyone with tastebuds. Get it in pure form with just cheese and the usual suspects or, who are you kidding, stacked with chicken-fried bacon. Be warned: Chef Randy Rucker’s 44 Farms burger is for mustard lovers only. A thick coat of the sweet and hot house-made condiment is what makes this already-great, wood-grilled burger extraordinary. A hefty amount of melted Redneck cheddar and house pickles finish the job. This old-school classic has managed to keep up with the cool kids, despite being a hefty $32. Chef John Sheely’s house blend of chuck, brisket, and short rib helps with that, as does the decadent foie gras topping and truffle frites side. 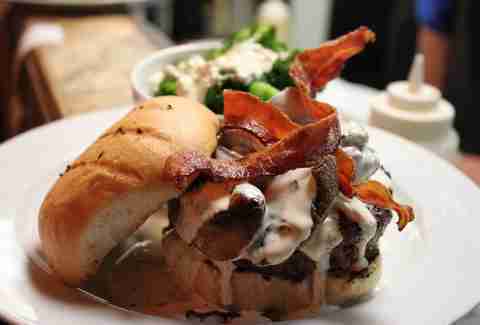 If you're looking to save a buck, the bacon-marmalade-topped M Bistro burger is just $11 at the bar. Texas is awesome, because living here means you can get a hulk-worthy, house-rubbed 10oz chargrilled burger, pack it in ‘shrooms, caramelized onions, bacon, then cover it in thick, creamy Texas gravy and call it lunch. We're fairly certain it's clear at this point that eating all of these burgers will help you along in kicking the bucket, so if you've managed to make it this far, you may as well go balls to the walls. 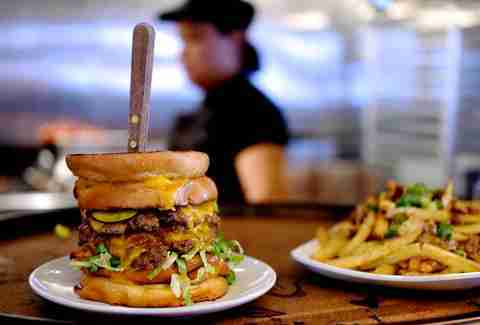 This is not so much an enjoyable burger experience, but rather a challenge to those brave enough to face the beef. Those who accept it will have two hours to consume 1.5lbs of ground beef, a FULL pound of bacon, 1/4lb of cheese, and all the trimmings. Victors will get their name on the wall of fame and all the glory that comes with having consumed nearly 2lbs of meat. Brooke Viggiano is a Houston writer whose goal in life is to be this granny attempting the Mega Mel Challenge. See her other life's desires @BrookeViggiano.